Tomatoes as an answer to prevent lung cancer? But wait, Dee – Don't you know that tomatoes cause inflammation and aggravate conditions such as arthritis? Alright, I'll agree that it's ‘Dr. Tomato' – But why haven't I heard of this before? Note: This is a very long article so be sure to use the Table of Contents to your right to navigate to the information you are interested in! Many scientists, dieticians and nutritionists agree – there are certain foods that are so chock full of vitamins, minerals, and other health components that these ‘super foods for super health' simply must be included in your diet as often as possible. Lowering disease risk, boosting your immunity and helping you lose weight are among the reasons why certain foods should make appearances in your diet regularly. To have a balanced diet, you must include items from every food group from grains to meat and fish, to vegetables and fruit. The chief dietetic value of apples lies in the malic and tartaric acids. These acids are of signal benefit to persons of sedentary habits, who are liable to liver derangements, and they neutralize the acid products of gout and indigestion. ‘An apple a day keeps the doctor away' is a respectable old rhyme that has some reason in it. The acids of the Apple not only make the fruit itself digestible, but even make it helpful in digesting other foods. Popular instinct long ago led to the association of apple sauce with such rich foods as pork and goose, and the old English fancy for eating apple pie with cheese, an obsolete taste, nowadays, is another example of instinctive inclination, which science has approved. The sugar of a sweet apple, like most fruit sugars, is practically a predigested food, and is soon ready to pass into the blood to provide energy and warmth for the body. A ripe raw apple is one of the easiest substances for the stomach to deal with, the whole process of its digestion being completed in eighty-five minutes. The juice of apples, without sugar, will often reduce acidity of the stomach; it becomes changed into alkaline carbonates, and thus corrects sour fermentation. It is stated on medical authority that in countries where unsweetened cider is used as a common beverage, stone or calculus is unknown, and a series of inquiries made of doctors in Normandy, where cider is the principal drink, brought to light the fact that not a single case of stone had been met with during forty years. The Apple will also act as an excellent dentifrice, being a food that is not only cleansing to the teeth on account of its juices, but just hard enough to mechanically push back the gums so that the borders are cleared of deposits. Rotten apples used as a poultice is an old Lincolnshire remedy for sore eyes, that is still in use in some villages. It is no exaggeration to say that the habitual use of apples will do much to prolong life and to ameliorate its conditions. In the Edda, the old Scandinavian saga, Iduna kept in a box, apples that she gave to the gods to eat, thereby to renew their youth. A French physician has found that the bacillus of typhoid fever cannot live long in apple juice, and therefore recommends doubtful drinking water to be mixed with cider. A glucoside in small crystals is obtainable from the bark and root of the apple, peach and plum, which is said to induce artificial diabetes in animals, and thus can be used in curing it in human beings. The original pomatum seems to date from Gerard's days, when an ointment for roughness of the skin was made from apple pulp, swine's grease, and rosewater. The astringent verjuice, rich in tannin, of the Crab apple, is helpful in chronic diarrhea. The bark may be used in decoction for intermittent and bilious fevers. Cider in which horse-radish has been steeped has been found helpful in dropsy. Cooked apples make a good local application for sore throat in fevers, inflammation of the eyes, erysipelas, etc. Apples contain flavonoids, antioxidants that improve immune function and prevent heart disease and some cancers. Green apples act as a liver and gall bladder cleanser and may aid in softening gallstones. Because of their high water content, apples are cooling and moistening and aid in reducing fever. Simply grate them and serve them to feverish patients. Steamed apples sweetened with honey are beneficial for a dry cough and may help to remove mucous from the lungs. Hippocrates (circa 400 BCE), the Greek physician considered the father of medicine, was a proponent of nutritional healing. His favorite remedies were apples, dates, and barley mush. Modern medical practitioners are beginning to recognize that the apple's abundant quantity of pectin is an aid in reducing high cholesterol as well as blood sugar, a wonder food for people with coronary artery disease and diabetes. *The nutritional value of apples will vary slightly depending on the variety and size. Originating in Malaysia, this super fruit is extremely rare in supplement form. The primary species name is garcinia atroviridus, and the Southeastern name for it is Assam Gelugur. The fruit itself cannot be ingested the way we’d bite into an orange or an apple, because it is extremely sour. Instead, the extract of this fruit is used as a way to add a zing to culinary dishes, and its leaves are crushed and brewed for tea. According to studies at the Forest Research Institute in Malaysia, Assam fruit has nourishing antioxidants, lowers blood lipid levels, and also inhibits lipogenesis, a metabolic process that turns carbohydrates into fat. In animal models, the fruit prevented the accumulation of plaque in artery walls despite high fat diets. Helps promote weight loss – We know; we had you at hello. Seriously, though, the amount of calories and carbohydrates is so negligible it makes bamboo shoots the perfect food to eat when you’re trying to lose weight. It’s filling without those extra calories and carbs which need to be burned off. Heart healthy –help dissolve LDL (bad) cholesterol in your blood Bamboo shoots contain nutrients which . This makes it a great part of a heart-healthy diet since the blood can flow freely through the arteries. And let’s not forget the low calories. Less fat in the bamboo shoots means less chance for cholesterol to get out of control. Also, the high amounts of potassium helps lower blood pressure. Improved bowel movements – Those negligible amounts of fat and calories coupled with high amounts of dietary fiber helps keep your bowels moving and improve your bowel function. Fights cancer – Because the leaves of bamboo shoots have chlorophyll, this can help control many mutations of cancer. Good for the immune system – No one ever wants to get sick. A strong immune system helps prevent you from contracting things. Bamboo shoots are jam packed with vitamins and minerals, all of which will help boost the immune system and prevent you from getting sick. Anti-inflammatory – Do you experience pain and inflammation? Bamboo shoots possess anti-inflammatory properties as well as natural pain killers. They help in the healing of ulcers as well. You can use the juice from bamboo shoots to treat external wounds and ulcers. Effective in treating respiratory disease – Boiling the shoots twice, once for 5 minutes and the second time for 10 minutes and then taking with honey will help clear up those respiratory problems. Stomach problems – The leaves of the bamboo shoots are used as a remedy for intestinal worms and other stomach disorders. Anti-venomous – It is believed that bamboo shoots can be used to cure some scorpion or snake bites. Used to clean wounds – Bamboo shoots can be used to effectively clean out wounds. Virtually every edible berry is a candidate for the super food list. And because different berries are available at different times of the year, you are pretty much guaranteed to have a selection no matter what. Food scientists note that berries contain many phytochemicals which are high in antioxidants as well as disease-fighting components. They have plenty of fiber, vitamin C and B vitamins like folate. What you do not want to do is cook or heat the berries because they will lose these powerful properties. Blueberries, blackberries, raspberries, and cranberries are but a few of many around the world. Description – The blueberry is often called the superstar among all berries. It is a berry that can be found in mild flavors to tangy ones too. Some are the size of a pea and others can be as large as a marble. Colors range from blue to maroon and black. They are extremely low in calories and a cup contains less than 85 calories. The berries grow in clusters and are in season between May and October. Native to – Blueberries are native to North America. The lowbush variety is also found in Europe and the Mediterranean area. About 30% of the world’s produce is grown in the US and Canada. Specific health benefits – Blueberries have a large number of antioxidants and therefore are associated with complete antioxidant support for the body. They improve the level of fat in the blood, reduce total cholesterol levels, lower triglycerides and increase the level of good cholesterol HDL. The berries also help in nerve cell protection and retina protection from damage caused by oxidation. University of Michigan Cardiovascular Center conducted a research that showed blueberries reduce belly fat and increase metabolic rate. Nutrients – Blueberries contain anthocyanins like malvidins, pelargonidins, delphinidins and peonidins. The Hydroxycinnamic acids they contain include coumaric acids, caffeic acid and ferulic acid and the Hydroxybenzoic acids are gallic acid and procatchuic acid. Kaempferol, quercetin and myricetin are the flavanols present in blueberries and it also contains pterostilbene and resveratrol too. Tips in buying, preserving and cooking – Blueberries should be washed carefully since they are fragile. They should be patted dry and not rubbed. Organic berries can be used without washing. High temperatures remove and damage the various nutrients found in the berry and these are best enjoyed fresh and raw. You can add blueberries to a shake. Other options include blueberries and yogurt, blueberry parfait or trifle. This sweet, flare-crowned, indigo superfruit is more than just a mouth-watering delight to your craving senses. Would you believe that this favorite has a wide range of micro-nutrients that do not only protect the body from diseases, but also aging? Blueberries, along with blackberries, strawberries, and plums, have the highest total antioxidant capacity of any food. It is being regarded as one of the “superfuits” having the promising combination of nutrient value, emerging research evidence for health benefits, versatility for manufacturing popular consumer products, and antioxidant strength. Antioxidants are thought to aid in guarding the body against the detrimental effects of free radicals to cells and the chronic diseases associated with the course of aging. The antioxidants present in this fruit can protect the cell, so there is less chance for aging. Blueberries contain 14 mg of Vitamin C and 0.8 mg Vitamin E per 1 cup of blueberries. Blueberries also contain anthocyanins and phenolics that can also act as antioxidants. With this, the effects of blueberries to the skin are copious. The compound anthocyanin, found in blueberries, is thought to slow down age-related loss in the mental capacity of humans. Those who eat more blueberries are thought to have better functioning in motor behavioral learning and memory. Anthocyanin also gives blueberries their color and might be the key factor of the blueberry’s antioxidant and anti-inflammatory properties. While it is thought that aging can decrease cognitive and motor functions, blueberries can be of huge help to improve mental functioning. Blueberries also have positive effects to balance and coordination. In a study by Dr. James Joseph of Tufts University, it was found that a diet loaded with blueberries counteracted poor balance and coordination associated with aging. In this study published in the Journal of Neuroscience, Joseph fed four groups of rats a normal diet. But among these groups were given blueberries, spinach, or strawberries. For 18 weeks, the rats were tested for mental functioning, muscle strength, coordination, and balance. The two groups which were fed with strawberry and blueberry extracts performed well on these tests, but the group fed with blueberries executed the most improvement. Not only that, findings also showed that blueberries improved the neuronal functioning of the rats. Dr. Joseph suspects the findings are a result of blueberries' rich store of flavonoids — phytochemicals that have an effect on cell membranes. A serving of blueberries provides a relatively low glycemic load while providing a diverse range of nutrients, which also means there are fewer calories (good news for calorie-watchers) in a serving full of phytochemicals and nutrients such as iron, vitamins C and E.
Because of the phytochemicals present, the risk of acquiring some deadly diseases may also be prevented. Anthocyanins, proanthocyanidins, flavonols, and tannins found in this wonderful fruit may help prevent cancer by inhibiting some cancer mechanisms. These components protect the DNA from damage and disintegration caused by free radicals. At a symposium on berry health benefits, there have been reports that eating blueberries and other similar fruits like cranberries may improve the cognitive deterioration occurring in Alzheimer's disease and other conditions of aging. Blueberries may help lower the damages of stroke. Researches have also shown that blueberries may help prevent urinary tract infections (UTI), hypertension, and hypercholesterolemia that can also lead to potentially fatal heart disease. With blueberries, your tongue, and more importantly your health would get the best out of it. Well, even without all these benefits in mind, who wouldn’t die for a serving of blueberries? Hmmmm… Anyone? Tiny red berries from China, also known as wolfberries, Goji Berries contain more carotenoid antioxidants than carrots. Legendarily known as the “longevity berry” due to the myth of Li Qing Yuen who supposedly lived to be 252 years old, Goji contains an exorbitant amount of vitamins, minerals, and sesquiterpenoids, which stimulate the secretion of the human growth hormone in the pituitary gland. Because of its rare ingredients, Goji has been closely linked with longevity and immunity, along with eyesight and liver function. Typically they are eaten raw, brewed into tea, or made into liquid extracts in Chinese medicine. They are also available in juice and trail mix form, which can be found either at Trader Joe’s or online health stores. Description – Cranberries are glossy on the exterior and have a tarty flavor. Cranberries are also called ‘bounceberries’ since ripe ones are checked by bouncing them. Native to – Cranberries are native to Europe, North America and Northern Asia. Specific health benefits – Health benefits of cranberry come from large amounts of vitamin C and varied phytochemicals. These berries have high anti-inflammatory and anti-cancer properties. Cranberries have always been associated with protection against urinary tract infection. The anti-inflammatory properties help in maintaining good digestive health. Consuming cranberry juice in large quantities is known to help in removing kidney stones. Nutrients – Cranberries contain phenolic acids like vanillic acid, caffeic acid, cinnamic acid and ferulic acid. They also have anthocyanins like cyanidins, malvidins and peonidins and flavonoids like quercetin, myricetin and kaempferol. This berry also contains ursolic acid. Tips in buying, preserving and cooking – Firmness and bounce are the two main aspects to check while buying cranberries. The ones with a deeper color are healthier since they contain more anthocyanin. You can store these berries for about 20 days in a refrigerator. Remove those that are discolored, leathery, sticky or tough when you use them. In most cranberry recipes, you do not need to cook them. They are a great option in salads to add tartness. Description – Raspberries belong to the family of fruits that include apples and apricots. They are considered to be the most popular berries after strawberries and blueberries. Raspberries are divided into red raspberries, black raspberries and purple raspberries. Black raspberries are also called thimbleberry, scotch cap and black cap. Native to – Red raspberry is native to Europe. Specific health benefits – Raspberries have been associated with many studies that show the positive effects of raspberry consumption on blood sugar management. The raspberry ketone found in these berries is known to increase metabolism and therefore help in weight reduction and obesity management. Nutrients – Like blueberries, raspberries also contain different kinds of anthocyanins (cyanidins, pelargonidins, delphinidins and malvidins), flavonols (quercetin, kaempferol), flavanols (catechins, epicatechins), tilirosides, tannins (ellagitannins, gallotannins, proanthocyanidins) and many hydroxybenzoic acids and hydroxycinnamic acids. Tips in buying, preserving and cooking – Wash the raspberries just before serving and do not leave them soaked in room temperature for too long. Those that seem too soft should just be used to make puree. You can use raspberries in porridge, yogurt or make a sauce to go with waffles or pancakes. Description – Strawberries are the most popular berries due to the lovely taste that they have. They are now available all through the year while the actual season was between April and June. With more than 600 different varieties, the taste also varies from sweet and fragrant to tangy and sour. Native to – Strawberries are native to the United States among other countries. The largest produce comes from California. Specific health benefits – A few servings of strawberries can help decrease blood sugar elevations among the diabetic. Ellagitannin is the polyphenol responsible for this amazing effect. High levels of antioxidants help in keeping cancer at bay. These berries are also associated with better bowel health like ulcerative colitis and Crohn’s disease. Nutrients – Anthocyanins, flavonols, hydroxy-benzoic acids, hydroxy-cinnamic acids, tannins and stilbenes in a wide variety are some of the nutrients one finds in strawberries. Tips in buying, preserving and cooking – Strawberries are more perishable than other berries. They last for only a couple of days at their best. Pick those that are bright in color and firm. You can freeze strawberries and use them for a year. However, they are available through the year now and therefore best bought fresh. They make good accompaniments with green salad, yogurt and as shakes. The list of health berries is large. Here are some others that you may also want to include in your list of things to buy at the grocery. Acai berries – Round and purple, this berry contains iron, calcium and fiber in large quantities. Blackberries – These berries are known to have the highest level of antioxidants among all berries available in the United States. They also have high dietary fiber, vitamin C and K and folic acid. Noni berries – A berry that has become popular of late due to its usefulness during menstrual cramps, bowel issues, diabetes and urinary tract infections. Maqui berries – Native to Southern Chile, this is a tart berry that has an abundance of iron, anthocyanins and polyphenols. It is used in many dietary supplements. Chokeberry – More commonly known as aronia, the chokeberry is naïve to Eastern America and Eastern Europe too. It is a more recent find in the country for its health benefits. These berries have 5 to 10 times more anthocyanins than cranberry. Boysenberries – Not very common in the United States, these berries are high in folate, fiber and vitamin E. Great for your hair and skin and nerve health. Marion berries – Known to prevent cancer, heart diseases and age-related degeneration, marion berries are also great for a healthy gut. Bayberries – Originally from China, bayberries are good for heart health and can prevent degenerative diseases. It helps in digestion and removes toxins from the human body too. Youngberries – Youngberries are considered to be great for the eye. They help in proper digestion and promote nerve health. They are also rich in iron. Gooseberries – Gooseberries are rich in vitamin C and are known to enhance hair growth and strength. These have been used in hair tonics in Ayurveda for centuries. The Indian gooseberry or the amla is recommended for diabetics since it stimulates the islets of Langerhans that produce insulin. It is also good for the heart, improves appetite and has anti-aging properties too. Hackberries – A native of south eastern Asia, hackberries are known to be great for diarrhea, dysentery, colic, menstrual cramps and other gastrointestinal tract ailments. Barberry – Known by other names such as berbery, mahonia, holy thorn and Pepperidge, this berry is considered to be native to Europe. Flowers of this plant are used to treat rheumatism. It has liver cleansing properties, helps contain diarrhea and protects against various bacterial infections too. Juniper berries – With a nice blue and purple hue, juniper berries improve digestion and aid in better kidney health. Cloudberries – Possible health benefits of this orange berry include better oral health, reduced aging, better lung health and higher immunity levels. Bearberry – Used in traditional Europe as a treatment for bladder infection, bearberry can be used to make a concoction like tea. Origins – Broccoli has its origins in Italy. It was used avidly in Rome and spread from here to the Near East. During the colonial era, broccoli was introduced to America. Health Benefits – Steamed broccoli can help in cholesterol reduction due to the bile binding fiber that it contains. Broccoli contains 3 glucosinolate phytonutrients that aid in the detoxification of the body. Broccoli helps in initiating a process that alienates toxins and removes them from the system. Vitamin D deficiency is a common issue in many countries. Significant amounts of vitamin A and vitamin K present in broccoli help the body make the required amounts of vitamin D.
Folate is instrumental in forestalling certain neural birth defects. Obstetricians advocate increasing folate levels during pregnancy. Broccoli holds polyphenols, a champion antioxidant substance. And, it bears more of it than most other veggies and fruits. There are only 2 in front of it. Antioxidants battle diseases such as cancer. Consuming broccoli and cauliflower (another cruciferous powerhouse) may greatly quash your risks of developing cancer in the body. If you've already developed tumors, this veggie can cut down their growth across time. Researchers are poring over the effects right now. Fiber helps to lower cholesterol. It affords you that feeling of fullness therefore you consume less at a meal. Lower cholesterol entails less clogging of the arteries and the strokes and heart attacks that may result. As the bad cholesterol numbers drop, the good cholesterol numbers ascend to keep blood vessels fit and elastic. Kaempferol, a flavonoid present in broccoli, can help us reduce the negative effects of substances we are allergic to. Tips on buying, storing and using – When choosing broccoli flowers make sure they are compact and far apart. A uniform color indicates a better product too. Yellow florets indicate that the flowers have over matured. Placing broccoli in a plastic bag from which air has been removed is the best way to store broccoli. It can remain in the refrigerator for about 10 days. Do not wash before storing. In fact it is also best to cut it as least as possible in order to retain maximum vitamin C in it. You can eat the stems and leaves of the broccoli plant. They provide immense flavor to the food. Retain low cooking temperatures while cooking this healthy food. The stems take longer to cook and so should be introduced to the dish earlier on in the cooking process. Cabbage juice is great for relief of all sorts of ulcers, from peptic ulcers to skin ulcers. The juice can also be used on burns, bites, cold sores and acne. The cabbage leaf is both soothing and antiseptic, also having the ability to draw out toxins from the skin. A poultice can be made from cabbage leaves and used on such conditions as: wounds, burns, boils, bruises, ulcers, blisters, stings, cold sores, shingles, and headaches. Cabbage leaves have a good reputation for relieving sore and inflamed breasts during breastfeeding. Its anti-inflammatory properties make it idea for relief of swollen joints. The poultice can also be used to help soothe harsh coughs. To make a cabbage poultice: remove the ribs from the greenest leaves, Soak in warm to hot water to soften the leaves. Crush with a rolling pin, then wrap the area using a bandage or cling wrap to hold the cabbage in place. This can be left for a few hours. Fiber: Cabbage is a stomach's best friend. Like its more popular relatives brussel sprouts, broccoli, and kale, cabbage is a fantastic source of fiber. Raw cabbage has also been shown to help cure stomach ulcers . Antioxidants: Red cabbage is plum full of anthocyanins, a type of antioxidant routinely found in blue, purple, and red plants . Studies show antioxidants can reduce inflammation, provide cancer protection, and boost brain function. Lowers cholesterol: Cabbage prevents bile from absorbing fat after a meal, which lowers the overall amount of cholesterol in the body . In comparison to the orange, Camu berries have a concentration of 50,000ppm, or parts per million, of vitamin C which equals about 2 grams per 100 grams of fruit. The average orange, on the other hand, has anywhere from 1,000-4,000ppm. Overall, vitamin C plays a crucial role in our nervous system and overall well-being. Because our bodies don’t manufacture vitamin C naturally, we must consume it through dietary sources. Since the Camu berry contains a rich concentration of vitamin C, it has the potential to fend off degenerative diseases like Alzheimer’s, protect the eyes against glaucoma and cataracts, enhance cognitive performance, ease arthritic inflammation, and combat depression, which, Adams notes, is “sometimes the result of malnourishment.” Anti-gingivitic, antiviral, and anti-hepatitic, the Camu berry has no side effects, and is consumed in powder form by either stirring it in water or sprinkling it into healthy smoothies. Just two teaspoons of dried chili peppers provides a very respectable amount of the B complex vitamins, as well as vitamins A, C, E, and K. You'll also find a good dose of calcium, iron, and manganese, along with some dietary fiber and even Omega-3 fatty acids. As you can see, that kick of heat offers more than just flavor. The substance found in chili peppers that produces the heat we know and love is called ‘capsaicin' which acts to prohibit inflammation. You'll find more of this substance as the pepper gets hotter. So enjoy a habanero for the greatest anti-inflammatory benefits. Jalapenos offer a less potent amount of capsaicin, but they are all good for you, helping to reduce pain from inflammation associated with arthritis, for instance. Cayenne has been used successfully to reduce cholesterol in several studies. Adding hot chili peppers to your diet may also help fight those damaging ‘free radicals' in your blood stream. In some studies it was even shown that health benefits of eating chili peppers regularly over time include lower resting heart rate and increased blood flow to the heart. Most of us already know that when we enjoy a healthy dose of chili peppers we breathe a bit easier. Yes, chili peppers do help clear sinuses, relieving congestion in the respiratory system. This process helps reduce the risk of sinus infections in those who suffer from upper respiratory inflammation. The bright red color of chili peppers is a clue to the super saturation of beta-carotene; vitamin A. Along with a good dose of vitamin C, this combination of vitamins helps to boost immunity and builds a natural defense against the pathogens that attack us on a day to day basis. The mucous lining in our respiratory and digestive system is kept healthier, which keeps us healthier. Chili peppers have a bad rap when it comes to creating stomach ulcers. Eating too much of this good thing may cause stomach problems, but eating a little chili pepper every day acts in just the opposite way by killing bacteria and stimulating the stomach lining to secrete protective juices for digestion. This process prevents ulcers rather than causes them. Weight loss is another of the health benefits of eating chili peppers. When you feel that heat after eating a good chili pepper, you are feeling your body burning calories. The health benefits of chili peppers also include helping to reduce the amount of insulin needed to lower blood sugar levels after eating a meal, helping to eliminate those sugar ‘spikes' that can trigger weight gain and be a contributing factor in diabetes. Origins – The origins of collard greens is similar to that of kale as well. They were also introduced to the United States in the 17th century by English settlers. Health Benefits – Since the similarities between kale and collard green are so many, it is obvious that the health benefits also follow suit. Collard greens have cholesterol lowering capabilities that match those of kale due to the same bile binding effect. In fact in one recent study, collard greens emerged as better than any other green in this respect. Collard greens also provide protection from cancer. Glucosinolates like glucoraphanin, gluconasturtiian, sinigrin and glucotropaeolin are considered to provide the vegetable with cancer preventive, detoxification and anti-inflammatory properties. Tips on buying, storing and using – Leaves that are not wilted, firm and greener in color are freshest and healthiest. Smaller leaves have a milder smoky flavor and therefore best for children. Store them in the chiller to avoid wilting. If they are left in the refrigerator for too long, they may start tasting bitter. To extract the maximum health benefits, let them lie for about 5 minutes before cooking. Adding some lime juice to the leaves brings out healthy enzymes in them too. Honey (raw, unprocessed) is primarily composed of natural sugars (carbohydrates) and water, in addition to trace enzymes, minerals, vitamins, amino acids and phytonutrients. Honey is an all-natural sweetener which provides 17 grams of carbohydrates and 64 calories per tablespoon – without any added ingredients. Raw, unprocessed honey also contains a wide variety of flavonoids and phenolic acids which act as antioxidants, scavenging and eliminating free radicals. Generally speaking, darker honeys have higher antioxidant content than do the lighter honeys. Although our food ranking system did not qualify honey as a dense source of traditional nutrients, it did emerge as a source of vitamin B2, vitamin B6, iron and manganese. In addition to a multitude of antioxidants, another of the benefits of honey is that one ounce of raw honey contains approximately 20 vitamins, 18 amino acids, 16 minerals, and a ton of antioxidants as well as plenty of phytonutrients and flavonoids. Honey, in its raw state, is an antibacterial, antiviral and antifungal substance – and these are three of the best benefits of honey. Raw honey contains vitamins B1, B2, C, B6, B5 and B3 all of which change according to the qualities of the nectar and pollen. Besides the above, copper, iodine, and zinc exist in it in small quantities. Several kinds of hormones are also present in it. Approximately one half of the human diet is derived directly or indirectly from crops pollinated by bees. Today honeybees are an essential part of a healthy agriculture economy. For a complete nutrient listing for honey, please visit USDA’s National Nutrient Database, http://www.nal.usda.gov/fnic/foodcomp/search/. So, what is the difference between the benefits of honey I find at my local grocery store and the ‘raw' honey that is supposed to be so much better for you (and is also a lot more expensive!). Is it a big deal to get raw honey instead of the clear/liquid honey? Are there more benefits of honey if it's raw instead of processed? In a word, yes! Raw honey is the concentrated nectar of flowers that comes straight from the extractor; it is the only unheated, pure, unpasteurized, unprocessed honey. It is the only type of honey that allows you to enjoy all of the health and beauty benefits of honey. Although many benefits of honey can be attributed to processed honey, it does not have health and beauty benefits to the extent that raw honey does. The problem with the heat pasteurization process is that many nutrients are very sensitive to it and do not survive it, thus the benefits of honey that you are looking for will be greatly decreased when you use processed honey. You may get strange looks when you tell people your raw honey is ‘alive', but you're absolutely correct to a certain extent. It's the beneficial enzymes found in raw honey that make it so digestible, and beneficial, to humans. When honey is processed by heating and pasteurization, many of the phytonutrients present in it are lost. Raw honey often contains propolis, a mixture of resins used by the honeybees to seal their hive against viruses and bacteria. Propolis has a large number of nutrients that have significant antibacterial, antiviral and antifungal properties. Processed honey also contains antibacterial, antiviral and antifungal properties, although it is not as effective as raw honey. Raw honey is filtered, but to a very small degree, and in a manner which does not destroy the health promoting enzymes and other nutrients or the the health and beauty benefits of honey. EXPECTORANT: A mixture of equal quantities of honey and ginger juice is a good expectorant. It helps in colds, cough, sore throat and runny nose. CHOLESTEROL: In a study at the University of Illinois at Urbana-Champaign, researchers found that taking honey every day helped improved levels of antioxidants in the blood, which can keep bad cholesterol from oxidating. Mix four tablespoons of honey into a 16-ounce glass of water. Honey should be taken as part of a heart-healthy diet. A natural sweetener, honey can be substituted for sugar in baked goods. IMMUNE SYSTEM: Immune system boosting is another of the many health benefits of honey. Research conducted in several hospitals in Israel found honey effective in decreasing the incidence of acute febrile neutropenia (when high fever reduces white blood cell count) in 64% of patients. Honey also reduced the need for Colony Stimulating Factor (a compound produced in the cells lining the blood vessels that stimulate bone marrow to produce more white blood cells) in 60% of patients with acute febrile neutropenia; increased neutrophil count (another type of white blood cell), decreased thrombocytopenia (low platelet count), and stabilized hemoglobin levels at >11 gm/dl (a bit low but way better than full blown anemic). ANTIBACTERIAL/ANTIFUNGAL PROPERTIES: Honey has anti-bacterial and anti-fungal properties and thus it can be used as a natural antiseptic. WOUNDS and SKIN: Significant research is being done to study benefits of honey in treating wounds. Research thus far has found that honey possesses antimicrobial properties, it helps in promoting autolytic debridement, it deodorizes malodorous wounds, it speeds up the healing process by stimulating wound tissues, it helps in initiating the healing process in dormant wounds, and honey also helps in promoting moist wound healing. When topically applied, honey used as a salve can safely and effectively treat diabetic ulcers, canker sores, bleeding gums, and eczema, and can be used when topical antibiotics are not well-tolerated. ALLERGIES: If you have allergies, then this may very well be your top pick of the many health benefits of honey. If you eat honey that is local to your area, it may help prevent your seasonal allergies. Bees use the pollen from local plants and eventually it ends up in your honey. BODY CLEANSING: To help cleanse the blood, mix one glass of warm water with 1-2 teaspoonful of honey and one teaspoonful of lemon juice. Take this preparation daily before you go to the toilet. It will also reduce fat and cleans your bowel. ENERGY SOURCE: According to the USDA, honey contains about 64 calories per tablespoon which means that honey is also used by many as a source of energy. On the other hand, one tablespoon of sugar will give you about 15 calories. Furthermore, the carbohydrates in the honey can be easily converted into glucose by even the most sensitive stomachs. This means that honey is very easy to digest. DIARRHEA: In treating diarrhea, honey promotes the rehydration of the body and more quickly clears up the diarrhea and any vomiting and stomach upsets. The anti-bacterial properties and benefits of honey, both the peroxide and non-peroxide, are effective in the laboratory against MRSA strains of bacteria which are notoriously resistant to antibiotics and are sometimes responsible for the closing of hospital wards. WEIGHT LOSS: This is one of the most popular health benefits of honey. In a year-long animal study comparing the effects of sucrose, honey and a low glycemic index (GI) sugar-free diet, rats on the honey-based diet showed: reduced weight gain and percentage of body fat, decreased anxiety, better spatial recognition memory, improved HDL cholesterol (15-20% higher than rats fed sugar or sucrose diets), improved blood sugar levels (HA1c), and reduced oxidative damage. ANTIOXIDANT: Daily consumption of honey raises blood levels of protective antioxidant compounds in humans, according to research presented at the 227th meeting of the American Chemical Society in Anaheim, CA, March 28, 2004. BURNS: A study carried out over the six-year period from 1987 to 1993 on 450 patients, by M.Subrahmanyam at the Solapur Medical College, India, claimed that burns healed faster and with less scarring than with conventional treatments. HANGOVER: Get rid of your hangover by mixing two spoons of honey with half a cup of orange juice and half a cup yogurt. Blend them together properly and gulp it down. BLOOD BUILDING: Honey provides an important part of the energy needed by the body for blood formation. In addition, it helps in cleansing the blood. It has some positive effects in regulating and facilitating blood circulation. It also functions as a protection against capillary problems and arteriosclerosis. Does not accommodate bacteria: This bactericide (bacteria-killing) property of honey is named “the inhibition effect”. Experiments conducted on honey show that its bactericide properties increase twofold when diluted with water. It is very interesting to note that newly born bees in the colony are nourished with diluted honey by the bees responsible for their supervision – as if they know this feature of the honey. ATHLETIC PERFORMANCE: Recent research has shown that one of the lesser-known benefits of honey is that it is an excellent ergogenic aid and aids in boosting the performance of athletes. Honey facilitates in maintaining blood sugar levels, muscle recuperation and glycogen restoration after a workout. The ornamental one is best suited to salads since it has a milder flavor. Dinosaur kale has embossed leaves and it is slightly sweet in flavor. Origins – The origins of kale can be traced to Asia Minor from where it was brought to Europe 600 years before Christ. It was grown extensively in ancient Rome. It was brought to the United States by English settlers in the 17th century. Health Benefits – Kale is known to be great for those who want to lower their total cholesterol. It is also beneficial for those who have a family history of high cholesterol. These benefits manifest themselves if the kale is steamed and not sautéed or fried. The fiber binds with bile acids and forces more of these acids to be secreted. When that takes place, cholesterol levels reduce. Kale is being scientifically tested for being effective in 5 different kinds of cancer. These are bladder cancer, breast cancer, ovary cancer, colon cancer and prostate cancer. The nutrient responsible for these anti-carcinogenic capabilities is called isothiocyanates. Detoxification is another heath benefit associated with kale. Isothiocyanates help in changing the detoxification capabilities of the body at a very basic level. While the jury is still out on the positive effects of kale on inflammation, the omega 3 present in the vegetable helps reduce internal inflammations. Tips on buying, storing and using – The kale leaves that you pick up should be dark green in color. A darker green indicates a higher level of phytochemicals and therefore more health benefits. The stems should be hard and moist. It is obvious that the leaves should look fresh and not yellow or wilted. Smaller size leaves are milder than those that are large. You can store kale in a plastic bag and remove as much air as you want. This should stay in the refrigerator for about 5 days. It is advisable to rinse kale under the tap before using it. Allow it to sit for about 5 minutes before you start cooking. Steaming the leaf is the best way to consume kale since it provides the cholesterol lowering benefits to a much higher extent. All these species differ in one way or the other but in general, they are very low in carbohydrates, fat, calories, sugar and sodium. But they also provide healthy nutrients such as B vitamins, copper, selenium, and antioxidants. Consuming whole unprocessed foods like mushrooms offers a unique quality of healthy living. With so many edible species in existence, it’s hard, to sum up the health benefits of mushroom. But are trying here to elucidate benefits common to most types of mushroom varieties. Mushroom is known to be a natural cancer remedy. A 2010 scientific study published in the Journal of Experimental Biology and Medicine tested and analyzes five species of mushrooms (maitake, crimini, portabella, oyster and white button) and it was discovered that they significantly inhibit proliferation of breast cancer cells, suggesting mushrooms may be chemoprotective against breast cancer (3). Also, a 2012 study published on the Medical Journal 3 Biotech shows that the anti-cancer compounds in mushrooms play a crucial role as a reactive oxygen species inducer, mitotic kinase inhibitor, antimitotic, angiogenesis inhibitor, topoisomerase inhibitor all leading to apoptosis (cell death) and eventually checking cancer cell proliferation (4). In addition, selenium which is found in mushrooms plays a vital role in liver enzyme function and helps detoxify cancer-causing compounds in the body. It also prevents inflammation and inhibits tumor growth. Mushroom has an immune boosting property which is backed by science. The Beta-glucan found in many varieties of mushrooms provides protection against colds, flu, and other viruses. Lentinan which is found in shiitake, portobello, oyster and reishi mushrooms can boost your immune system. A 2005 study published in the Mediators of Inflammation shows that lentinan stimulates the production of interferon, which stimulates the immune system (6). It is also important to know that mushrooms fungal extract contains a compound similar to penicillin which inhibits microbial growth and fungal infections. Mushrooms are devoid of cholesterol, but they are also a good source of chitin and beta-glucan which helps in lowering cholesterol levels. A study suggests that mushrooms reduced the level of LDL “bad” cholesterol and VLDL cholesterol in hereditary hypercholesterolemic rats (7). So, adding mushrooms to your diet is one way of lowering the level of cholesterol in your body. These fungal mushrooms have sterol compounds that interfere with endogenous cholesterol production in the liver, at the same time raising the level of HDL “good” cholesterol. They also contain phytonutrients that prevent cell adhesion to blood vessels and forming plaque buildup, which maintains healthy blood pressure and improves blood circulation. The potassium content of mushroom contributes to its function in blood pressure. A research study shows that the maitake mushroom significantly reduces blood pressure in spontaneously hypertensive rats (8, 9). Also, potassium which is a potent vasodilator helps relax the blood vessels thereby reducing blood pressure and risk of cardiovascular disease. Mushrooms are a nutrient-dense food with low calories which makes them ideal for weight loss programs. Studies suggest that substituting mushrooms for red meat might help you lose weight. Consuming mushrooms over a standard period of time is linked with a healthy body weight and reduced waist circumference. In addition, mushrooms contain two types of dietary fibers in their cell walls, beta-glucans, and chitin. These fibers increase satiety and reduce appetite. Mushrooms are one of the few dietary sources of fat-soluble vitamin D. This vitamin is normally obtained from exposure to the sun. Exposing mushrooms to the sun increases the concentration of vitamin D. Consuming food rich in vitamin D can help reduce the risk of certain medical conditions like cancer, heart disease, mood disorder and bone loss. Two varieties of mushrooms button and criminis are particularly high in vitamin D, but criminis are also high in another vitamin; vitamin B12 which is very important for strict vegetarians. These two vitamins are vital for the overall health of the body. As stated above, mushrooms are a great source of B vitamins, which play a role in energy production. One of the importance of b vitamins is in neurotransmitter function, which in turn prevents thyroid disorders and support energy metabolism. Mushrooms can pose danger to once health, most especially the wild, non-edible ones. They are highly poisonous and look similar to the edible ones. If you buy mushrooms or pick them from the words you have to be very careful to pick good species or you consult a trained person to help you identify them very well. Many wild mushrooms contain toxic heavy metals which are very dangerous to the health and in extreme cases could lead to death. Also, to take advantage of mushrooms, you should cook them very well. This is because the cell walls of mushroom are tough, making it difficult for the body to get all the nutrients. Sufficient cooking breaks down the cell wall and inhibit anti-digestive elements and destroy many toxins. Be reminded that mushrooms contain purines and they have been linked to health problems in some cases. Purine breaks down to form uric acid, which on accumulation leads to gout. It is advisable to eat mushrooms in moderation, not in addiction. Some other extremely healthy green leafy vegetables include Swiss chard, mustard greens, Romaine lettuce, cabbage, iceberg lettuce, bok choy and endives. What exactly makes pumpkin so super? The powerful antioxidants known as carotenoids give this food its super status. Carotenoids have the ability to ward off the risk of various types of cancer and heart disease, along with, cataracts and macular degeneration. Because pumpkin is high in fiber, it can aid in weight loss efforts. Pumpkin seeds, which are naturally rich in certain plant-based chemicals called phytosterols, have been shown in studies to reduce LDL or “bad” cholesterol. Pumpkins contain the antioxidant beta-carotene, which may play a role in cancer prevention, according to the National Cancer Institute. Health magazine reported the same free-radical-neutralizing powers of the carotenoids in pumpkin that may keep cancer cells at bay can also help keep the skin wrinkle-free. Pumpkin seeds are rich in the amino acid tryptophan which is important in production of serotonin, one of the major players when it comes to our mood, WebMD reports. A cup of cooked pumpkin has more of the refueling nutrient potassium, with 564 milligrams. The extra potassium helps restore the body's balance of electrolytes after a heavy workout and keeps muscles functioning at their best. At 7384 mg per 100 g, it is one of the vegetables in the Cucurbitaceae family featuring highest levels of vitamin-A, providing about 246% of RDA. Vitamin A is a powerful natural anti-oxidant and is required by the body for maintaining the integrity of skin and mucusa. It is also an essential vitamin for good visual sight. Research studies suggest that natural foods rich in vitamin A may help human body protect against lung and oral cavity cancers. Pumpkin is a good source of B-complex group of vitamins like folates, niacin, vitamin B-6 (pyridoxine), thiamin and pantothenic acid. Pumpkin seeds could be especially healthy for men. Researchers in Taiwan found pumpkin seed oil blocked unhealthy prostate growth in male rats. A quarter cup of the seeds also contains about 2.75 mg of zinc (about 17 percent of the recommended daily intake for adults), which contributes to male sexual health. When young men in a Wayne State University study restricted their dietary zinc intake, they had significantly lower levels of testosterone after 20 weeks. Pumpkin seeds are concentrated sources of protein, minerals and health-benefiting vitamins. For instance, 100 g of pumpkin seeds provide 559 calories, 30 g of protein, 110% RDA of iron, 4987 mg of niacin (31% RDA), selenium (17% of RDA), zinc (71%) etc., but no cholesterol. Further, the seeds are an excellent source of health promoting amino acid tryptophan. Tryptophan is converted to GABA in the brain. The Art of Manliness has a great recipe for how to roast pumpkin seeds. And here are a few ways to spice up your roasted pumpkin seeds. There are a lot of fish in the sea with great nutritional properties but salmon is a clear winner when it comes to promoting great health and disease-fighting components. Salmon is high in omega 3 fatty acids which help lower the “bad” cholesterol in the blood and promote lower blood pressure and better heart health. When given the choice, select wild salmon over farm-raised salmon as they have more of the healthy components. Origins – It is believed that spinach has its origins in Persia and India. It was introduced to China in the 7th century. It was introduced to Europe in the 11th century by the Spanish Moors. It was called the ‘Spanish vegetable’ in England for some time after that. Netherlands and United States produce the maximum amount of spinach in the world today. Health Benefits – Spinach contains high levels of oxygen sensitive phytonutrients. The Vitamin C present in spinach helps protect these nutrients. Along with large amounts of vitamin K, they help in maintaining good bone health and can therefore help prevent osteoporosis. Glycoglycerolipids that are important in the process of photosynthesis in the spinach plant is now known to improve digestive health. Many ailments like ulcerative colitis and other inflammation related digestive issues can be prevented by regular intake of spinach. Lutein and Zeaxanthin are two carotenoids present in spinach that aid in better eye health. Intake help in delay of age-related macular degeneration. Tips on buying, storing and using – Leaves of the spinach you choose should be a vibrant green. They should look fresh and not wilted or yellow. Water exposure spoils spinach and therefore it should be stored without washing. Run it thoroughly under tap water when you are about to cook it since they tend to gather dust while on the plant. Soaking spinach is also not a good idea since the nutrients tend to run into the water. Boiling spinach for using in dishes is the best way to use it. But make sure that you use the water since it may have the essential nutrients you need. Believe it or not, a sweet potato can be quite good for you whenever it isn’t being smothered in cream, marshmallows, or butter. Like with any root vegetable, the sweet potato is best when it’s been baked under high heat to soften and sweeten the insides. A sweet potato baked in nothing else but a little olive oil will taste sweeter than you’d believe, much sweeter than any other root vegetable, and better yet it’s loaded with essential vitamins and minerals. Not convinced? A single serving (about a cup’s worth) of baked sweet potato contains approximately the following amounts of nutritious goodness. It has more than half your day’s worth of vitamin C, a third of your daily intake of vitamin B6, and a whopping 700% of your vitamin A. A single serving also yields more than half your day’s worth of manganese, and more than a quarter of your suggested daily potassium intake. It also has over a quarter of your daily fiber and has far fewer calories than a regular potato of the russet variety. Again, this is in a single cup of baked sweet potato. You say tomato, I say tomahto – but however you say it, what is rarely recognized is how effective a natural medicine the gold old tomato is. One of the best-known health benefits of eating tomatoes is their high Lycopene content. Lycopene is a vital antioxidant that helps in the fight against cancerous cell formation as well as other kinds of health complications and diseases. Free radicals in the body can be flushed out with high levels of Lycopene, and the tomato is so loaded with this vital antioxidant that it actually derives its rich redness from the nutrient. Lycopene is not a naturally produced element within the body and the human body requires sources of Lycopene in order to make use of this high-powered antioxidant. While other fruits and vegetables do contain this vital health ingredient, no other fruit or vegetable has the high concentration of Lycopene that the tomato has. Cancers such as prostate cancer, cervical cancer, colon cancer, rectal cancer, and cancers of the stomach, mouth, pharynx, and esophagus have all been proven to be staved off by high levels of Lycopene. Researchers introduced Lycopene into pre-existing cancer cell cultures and the Lycopene prevented the continued growth of these cultures. This is pretty powerful evidence that the health benefits of eating a tomato are really quite phenomenal. It takes as little as 540 milliliters of liquid tomato product to get the full benefits of Lycopene. This means that a daily glass of tomato juice has the potential to help keep a person healthy for life. New research is beginning to indicate that tomatoes may be used to help prevent lung cancer. Two powerful compounds found in tomatoes-coumaric acid and chlorogenic acid-are thought to block the effects of nitrosamines. These are compounds that not only are formed naturally in the body, but also are the strongest carcinogens in tobacco smoke. By blocking the effects of these nitrosamines, the chances of lung cancer are reduced significantly. The tomato has one of the highest glutamic acid content of any vegetable. The quantity of glutamic acid is about 86 – 140 mg per 100 g of tomato. For that reason, tomato is probably considered the most widely used vegetable in cooking. Glutamic acid (glutamate) is an amino acid used by the body to build proteins. Glutamate is the most common excitatory (stimulating) neurotransmitter in the central nervous system. Glutamic Acid is important in the metabolism of sugars and fats, and aids in the transportation of potassium into the spinal fluid and across blood-brain barrier. Although it does not pass the blood-brain barrier as readily as glutamine does, it is found at high levels in the blood and may infiltrate the brain in small amounts. The brain can use glutamic acid as fuel. It can attach itself to nitrogen atoms in the process of forming glutamine, and this action also detoxifies the body of ammonia. This action is the only way in which the brain can be detoxified from ammonia. Glutamic acid may help to correct personality disorders and is useful in treating childhood behavioral disorders. It is used in the treatment of epilepsy, mental retardation, muscular dystrophy, ulcers, and hypoglycemic coma, a complication of insulin treatment for diabetes. It is a component of folate (folic acid), a B vitamin that helps the body break down amino acids. The fluid produced by the prostate gland also contains amounts of glutamic acid, and may play a role in the normal function of the prostate. Because one of its salts is monosodium glutamate (MSG), glutamic acid should be avoided by anyone who is allergic to MSG. All meats, poultry, fish, eggs, dairy products, as well as kombu are also excellent sources of glutamic acid. Some protein-rich plant foods also serve as sources. Ninety-five percent of the dietary glutamate is metabolized by intestinal cells in a first pass. Other nutritional and health benefits of the tomato include its action as a natural antiseptic to prevent infection, and it's ability to help indigestion, diarrhea, improve liver function, reduce bile attacks and heart disease. Nicotine acid in tomatoes can also help lower cholesterol and can help impotency and increase the number of sperm and improve sperm motility. Tomatoes also contain large amounts of Vitamin C, providing 40 percent of the daily value (DV). They also contain 15 percent DV of Vitamin A, 8 percent DV of potassium, and 7 percent of the recommended dietary allowance (RDA) of iron for women and 10 percent RDA for men. One word. HOGWASH! Ok, so I better back that up, eh? Let's see what Dr. Andrew Weil has to say. You know who he is, right? Dr. Weil is arguably the leading medical expert (and trail-blazing pioneer) on integrative medicine. He goes on to say, “If you’re interested in making dietary changes that reduce inflammation, and that might help alleviate the pain associated with osteoarthritis, I recommend including foods rich in omega-3 fatty acids such as salmon or another source of omega-3 fatty acids such as walnuts or freshly ground flaxseed. The spices ginger and turmeric have also been shown to reduce inflammation, and they are best taken as standardized extracts.” You can read his entire article on this here: Toxic Tomatoes? Why was the tomato not included in Traditional Chinese Medicine? During the ancient time, people thought that tomato was poisonous, especially its bright red pulp. Today, the tomato is often included in our snacks, meals, drinks and salads. However, many home cooks choose to buy canned tomato sauce, tomato ketchup, tomato paste, tomato juice, etc. for convenience. They don't realize two things. One, that if a fresh tomato is cooked properly, it can be the main seasoning for a dish. And, two, fresh tomatoes will always have higher levels of beneficial nutrients for your health. Choose skinless turkey. Turkey skin has a lot of fat. Whole turkeys are not sold with the skin off, but you can remove the skin before or after roasting. Skinless breasts and cutlets are best. Protein is important to a healthy diet, especially lean protein. Turkey is an excellent source of protein without the saturated fat of red meats or other protein sources, such as cheese. Vitamins abound in turkey. B vitamins, zinc and potassium are the most prevalent vitamins. These are essential for cardiovascular health, nerve function, disease prevention, and immune system function. Choose organic, free-range turkey whenever possible. This ensures that the nutrients are high, and organic turkeys will not contain antibiotics or hormones. Roast or broil your turkey. Those deep fat fryers are on sale every holiday season, but pass them up. Frying it adds a great deal of fat and calories, making this superfood into a naughty treat. Low-calorie protein is essential for a healthy lifestyle. Turkey is a little over 1/3 protein (a 100-gram serving has 34 grams of protein), and that same 100-gram serving has only about 160 calories. Heart health is an important topic these days, and turkey is an important component in heart health. Because it is low in saturated fat, it's a protein that aids the body without the “bad fat” side effects. Also, the B vitamins in turkey enhance heart health. Turkey is versatile, too. It can be served hot or cold, in soup or plain, on sandwiches or in salads. It makes a good snack or formal meal. Tryptophan is a naturally-occurring chemical that is found in turkey. It can also be found in supplements (often called L-tryptophan), and for good reason. Tryptophan has a calming effect and can even help people who have trouble sleeping. Tryptophan can help ease anxiety, panic, and other nervous problems. Weight can be kept in check by the ingestion of lean protein. Because it digests slowly, high protein meals and snacks help you feel full longer, enhancing weight loss. Proteins take a lot of calories and energy to digest, which also adds to turkey's low-calorie status. Origins – Turnip has been grown in the Near East for the last 4000 years. It was a common vegetable grown in ancient Greece and Rome too. This vegetable was brought to North America by English colonists and they played an important role during the slavery days when the turnip greens were left for the slaves while the root was consumed by the landlord and owner. Health Benefits – Turnip greens have large amounts of calcium – two times more calcium than mustard greens. Phytonutrients like glucosinolate are converted to isothiocyanates in the body that help prevent cancer. While these greens have not been researched as much as some other vegetables have been, the nutrient content of turnip greens tells us that they can do wonders for overall health too. Turnip greens contain high levels of vitamin C, vitamin E, manganese and beta-carotene. The main antioxidants present in this vegetable include quercetin, isorhamnetin, myricetin, kaempferol and hydroxycinnamic acid. Vitamin K and omega 3 fatty acids are the nutrients responsible for its anti-inflammatory effect. Tips on buying, storing and using – You will be able to buy turnip greens with the turnip itself. Just make sure that you do not throw away the greens and make use of them in some way. Like collard greens, it is best to wash them and sprinkle some lemon juice on them to bring out the nutrients. These can be used as salad greens. Some garlic, olive oil and black pepper will bring out the flavor in them too. There have been some researches done regarding wheatgrass and they show that it can help with numerous health problems and illnesses. It has been shown that wheatgrass has regenerative powers and it can also improve the immune system of humans. It is said that a bit of wheatgrass juice on a daily basis can improve your health and it can keep you strong. Even more, it can offer you energy that is equivalent to the energy that you would get from 4 Red Bulls. Besides being healthy, wheatgrass juice is nutritious as well. It comes with numerous different kinds of vitamins and minerals, proteins and about 30 different kinds of enzymes. Besides all these, the juice is also rich in calcium, magnesium, iron, phosphorus, sodium, potassium, cobalt, sulphur and zinc. As it has been mentioned before, wheatgrass juice is rich in chlorophyll, which supports the production of hemoglobin. If there is more hemoglobin, the blood is able to transport more oxygen to the tissues. This in turn offers numerous benefits, such as blood purification, keeping the blood sugar level within certain limits, helps fighting toxins, not to mention that this way heavy metals and cigarette smoke cannot get into the blood. Chlorophyll also has an anti-bacterial effect in case of the wounds and it also has a positive effect on the digestive tract. In the same time it seems like it is able to fight the toxins in the body and it can decrease the level of inflammation. This means that it can be used to fight arthritis, colitis, stomach ulcers, sore throats and other inflammations. In case you are in the journey of losing weight, this is something that wheatgrass juice can also help you with. It will decrease your appetite and speed up your circulation and metabolism. It has been mentioned before that it also offers you energy, and so you will be able to perform more activities, leading to burning more calories. It comes with very little calories, and it contains no cholesterol or fat and, on the other hand, it comes with protein and it contains all eight of the most important amino acids. The entire body gains when you consume wheatgrass juice, including the blood cells, hair, bones, glands, kidneys, muscles, liver, teeth, spleen and other body parts as well. Whole grains are inexpensive and may be stashed away for a long time in their whole form. Here's a listing of a few of the “alternative” whole grains, their health benefits, and a few hints on how to use them. Whole oats – rolled, steel cut, or groats – make a nutritious, high-fiber, cholesterol-lowering breakfast. Oats are also anti-inflammatory, making them a fine pick for those who suffer from allergies or colitis. If you would like to integrate oats into your diet in different ways, try grinding whole oats into flour (or buying oat flour) and adding it to baked goods. Replace 1/4 of each cupful of flour demanded in a recipe with oat flour. This is an ancient grain. Most barley is traded as “pearled” barley, which implies that it has had its hull removed. It's really digestible and may be added to soups, particularly beef-based soups. Barley flakes are a different form of this healthful grain, and may be consumed as a hot cereal. This is the sole alkaline grain, making it ideal for acidic conditions of the body. Its small, yellow, round seeds may be used in place of rice or couscous in recipes, or cooked and enjoyed as it is. Whole grains such as cooked, cooled millet may be blended with sauteed veggies or meat and shaped into croquettes. Brown rice is the whole grain form of white rice. Whole grains such as brown rice are easy to digest, rich in fiber and free of gluten, establishing it as a sound option for those on gluten-free diets. It contains the crucial vitamin thiamin, or B1, and heightens cognitive function. Substitute brown rice with white rice in any recipe that calls for rice, but make certain to allow for the added cooking time required for brown rice (about forty-five minutes in a saucepan; about twenty minutes in a pressure cooker). This mustard seed-like fruit isn't, botanically, one of the whole grains, but due to it's healthy benefits, we're going to lump it in here with the other whole grains. Like barley, it's an ancient food, having been used by the Aztecs. It's higher in protein and calcium than milk, and it contains magnesium and silicon which heightens calcium assimilation. It's an superior food for folks who are pregnant, breastfeeding, or otherwise committed to activities that incinerate numerous calories. It's gluten-free, yet can be added to bread along with wheat flour. It forms a sticky, sweet breakfast cereal once cooked. Buckwheat is botanically a seed, yet is regarded one of the whole grains and is handled as such in foods. It's likewise gluten-free and high in the antioxidant vitamin E. Buckwheat groats make a satisfying breakfast cereal. Buckwheat flour may be utilized to make hotcakes, and it may be cooked and used as a ground meat replacement in stuffed-vegetable dishes like cabbage rolls or bell peppers. High-protein quinoa has a nutty flavor, and is a different instance of one of the ancient whole grains that's botanically a seed. Quinoa is high in manganese and iron. It needs to be washed thoroughly before cooking to get rid of the bitter saponins that naturally coat it. Quinoa's mass increases fourfold when it's cooked, and may be used interchangeably with rice, millet, or couscous. Choosing the right foods, especially in times of stress, can make all the difference. These powerful foods pack an energizing punch and should be eaten in some form, daily. 1. Apples contain naturally-occurring chemical compounds known as phytochemicals, polyphenols, or flavonoids, some of which have been proven to have antioxidant activity that inhibits, or scavenges, the activity of free radicals in the body. Cell damage from free radicals can be a factor in certain cancers, heart disease, strokes, and other conditions. The major antioxidant components in apples are polyphenols contained mainly in the skin known as quercetin glycoside, phloretin glycoside, chlorogenic acid, and epicatechin. Quercetin has been reported to reduce carcinogenic activity, inhibit enzymatic activities associated with several types of tumor cells, enhance the antiproliferative activity of anticancer agents, and inhibit the growth of transformed tumorigenic cells. 2. Blackberries, Blueberries, Raspberries, Strawberries – Antioxidant compounds found in blueberries, sweet cherries, strawberries and blackberries may fight arterial disease by preventing the oxidation of LDL (‘bad') cholesterol, according to a team of researchers at the University of California, Davis. In studies conducted at the University, Dr. I. Marina Heinonen, a visiting scientist from the University of Helsinki in Finland, and colleagues extracted antioxidant compounds from blackberries, red raspberries, sweet cherries, blueberries and strawberries. In a series of experiments in laboratory culture dishes, they found that blackberries and Blueberries are of particular interest because of their high antioxidant capacity. They had the most antioxidant activity in one experiment and sweet cherries in another. 3. Fish and Omega Fatty Acids found in fish help prevent blood clots, heart attacks and improves the ratio of good to bad cholesterol. Consider salmon and tuna as great sources of Omega-3. By utilizing high potency Omega-3 from flaxseed and canola, Omega-6 from primrose and black currant and Omega-9 (or Oleic acid, a non-essential fatty acid) from Canola and Flax, you can create the right balance, while minimizing any chance of reoccurring imbalances . 4. Flaxseed is rich in Omega-3 and fiber. You can increase the benefits of flaxseed by having it cracked or ground. This allows us to take full advantage of the rich oil and fiber inside the seeds. Sprinkle the seeds over cereal or bake them into your favorite foods. 5. Grains are the staple of most diets all over the world. A rich source of vitamins and minerals, grains can be used for a variety of ailments based on not only their nutritional value but on their taste and temperature as well. Grains such as oatmeal and buckwheat reduce blood lipids, decreasing heart disease, colon cancer, alkalizing, balances over-acid conditions. 6. Grapes, Juice, Red Wine are rich in antioxidants called flavonoids and have been shown to prevent clogging of the arteries, blood clots and they also contain water-soluble vitamins that strengthen tiny blood vessels, which can help swollen feet or ankles, speed up the healing of bruises and promote healthy collagen for fewer wrinkles. Remember, moderation with red wine. Two glasses for women, three glasses for men are the beneficial amounts. Anything more than that and you loose these benefits. 7. Greens are an excellent source of vitamin A and a good source of vitamin C. For a bigger boost of vitamin A, buy greens that are medium to dark green (the darker the leaves, the more vitamin A). Many greens, such as spinach, kale, and collards are known for their mineral content, especially iron, calcium, magnesium-as well as the vitamins folate, riboflavin (B2) and vitamin K. Leaves are very rich in antioxidants– the carotenoids and beta-carotene, the tocopherols (vitamin E) and of course, vitamin C.
8. Nuts such as almonds, pecans and walnuts are some of the best sources of protein. They make a great snack and have been found to reduce heart attacks by 50% compared to those who did not enjoy these crunchy goodies. Again, do not overdue it. A couple hand fulls of each are all you need and try to avoid those that are drenched in too much salt. 9. Soy makes a great meat substitute and can significantly reduce your saturated fat intake. Some research has shown that soy keeps arteries flexible and bones stronger and benefits the heart and in 20% of pre and post menopausal women, helps reduce hot flashes. (Women with a history of cyst, fibroids, pcos or endometriosis should avoid soy). Folate has also been shown to lower blood levels of homocysteine, a risk factor for heart disease. High homocysteine levels, as well as decreased folate and vitamin B-12 levels, have also been associated with stroke and Alzheimer's disease. A healthy, well-balanced diet is your best option to get the folate you need. Be sure it includes at least five servings of fresh fruits and vegetables each day. Foods rich in folate include oranges and bananas, dark leafy green vegetables, asparagus, broccoli, liver, and many types of beans and peas, including lima, lentil and garbanzo, as well as fortified breads and cereals. The antioxidants in apples could help protect the brain from the type of damage that triggers Alzheimer's and Parkinson's disease, according to recent research. But it’s estimated that on average Americans only eat approximately one-seventh of an apple per day, nowhere near enough. Blueberries are an awesome food choice as well to arm your body to combat declining mental capacities. It’s also imperative to choose unsaturated fats so your circulatory system stays healthy. Healthy blood flow and blood vessels lessen the chance of brain damage due to strokes or compromised circulation. Commonly referred to as one of nature’s ‘perfect foods,’ bananas are perhaps best known for packing potassium, but they're also good sources of arthritis-fighting vitamin B6, folate, and vitamin C. They’re easy for your body to digest, and since they’re a great source of soluble fiber, they are an important player in your weight loss efforts, because you fell full after eating one without consuming a large number of calories. Foods rich in phytochemicals which are found in beans and cruciferous vegetables like broccoli, cauliflower, cabbage, brussels sprouts, and kale are strong choices. So are dark green leafy vegetables like spinach, romaine lettuce, and collard greens, which are packed with fiber, lutein, and carotenoids – all cancer-fighting substances. Focus on choosing foods that have abundant amounts of vitamins C, E, and A, all antioxidants themselves. These help protect you from cancer by preventing the growth of free radicals in your body. Tomatoes are an awesome cancer-fighting superfood. Not only do tomatoes contain lycopene, the antioxidant phytochemical that also helps prevent heart disease, but they're a good source of vitamins A, C, and E, all which do battle against cancer-causing free radicals. Add them to your salad or use as a topping on your homemade pizza. They’re also a great way of adding some zest to your favorite sandwich. Watermelon is also stuffed full of antioxidants, and includes about 80 percent of your daily vitamin C requirement. It is also a great source of vitamin A, or beta carotene. And like tomatoes, it also contains lycopene. Cabbage is a cruciferous vegetable, which help reduce the risk of colon and rectal cancer. Plus cabbage is rich in fiber and has almost 50 percent of daily requirement of vitamin C, making it a well-rounded superfood with cancer-fighting power. Carrots are also a wonderful source of fiber and beta carotene, and they have about three times the daily requirement of vitamin A. Did you know that one-quarter cup of kidney beans has the same amount of fiber and protein as two ounces of red meat? Whole wheat pasta is also a good source of fiber, and broccoli will tip the daily scales for your daily vitamin A and C needs. Toss them all together with your favorite low-fat Italian dressing for a simple dinner of cancer-fighting proportions. Strawberries and blueberries are rich in vitamin C and fiber. They’re quick and simple finger food, and easily be added to your favorite whole grain cereal oatmeal, or low-fat yogurt. Low-fat meats, fruits, veggies and whole grains all play a part in preparing your body to do battle. Another crucial element of your anti-cold defense system is water. When your body is dehydrated, it’s at an elevated risk of germs latching on and not letting go – so be sure to drink a lot of water and decaffeinated beverages to help your body remain hydrated and ready. Just one cup of yogurt a day may act to keep the gastrointestinal tract healthier, which can help you ward off colds. It must be yogurt with live cultures, as this is the key ingredient which helps keep the GI tract ready to rumble. An added bonus to eating yogurt is that recent studies suggest frequent dairy intake helps you shed extra pounds or maintain a healthy body weight. Garlic contains allicin, an antibiotic that has been shown to protect against complications from a cold in some research. Garlic can be added to many of your favorite recipes to spice them up and help you suit up to do battle against cold germs. It’s been said an apple a day keeps the doctor away. Well, so can an orange. One orange a day provides your recommended daily allowance of vitamin C. Oranges are also abundant in flavonoids, which aids your body’s cells to renew and stay healthy and strong. Green bell peppers are the veggie family’s best vitamin C source. Add them to a salad, or simply slice one up and eat it raw. Flavonoids are also present in peppers. You may even want to prepare a green pepper dip seasoned with garlic for an added germ-kicking effect. Lean ground beef, particularly when prepared with a bit of garlic, can maintain cell health and fight off illness. It’s a great source of protein, selenium and zinc, and when enjoyed with a bit of tomato, is a fantastic defense throughout cold season. Rich in omega-3 fatty acids, salmon and mackerel are always a great choice for dinner. Omega-3 fatty acids also help prevent heart disease and stroke and may help prevent some cancers. Plus, salmon contains selenium, an important antioxidant mineral. Be sure to choose wild salmon at the grocery store or local fish market, since it contains more omegas than farmed, or Atlantic, salmon. A recent study indicated that people who suffer from depression also have lower levels of the antioxidant vitamin E. So, though oil is high in fat and should be consumed in strict moderation, canola oil is rich in vitamin E. It’s a healthier alternative for sautéing foods and vegetables. Dark green vegetables like spinach and peas are high in folate, a key player in the production of serotonin. They’re also an excellent source of vitamin C and fiber. Fresh is always the best option, as canned versions tend to have lower nutritional value. Legumes are also high in folate and protein and low in fat, and are an excellent option for those who are vegetarian or meat-restricted diets. Chickpeas are rich in fiber, iron, and vitamin E. For a simple snack, combine a can of drained and rinsed chickpeas with some minced garlic, fresh lemon juice, and olive or canola oil in your blender or food processor. Add salt, pepper and other spices as you wish. The resulting hummus makes a healthy and hearty vegetable dip. Chicken and turkey are both rich in vitamin B6, which plays a role in serotonin production in the body. They are both a good source of selenium and other vitamins and minerals, too. Black currants are even richer in vitamin C than oranges, containing approximately three times the recommended daily intake for adults. It’s imperative that you get plenty of vitamin C since it helps prevent infections and helps keep the immune system healthy. Yogurt that includes live cultures has a positive effect on your GI tract, and as a result, helps the body purge the germs from the body more quickly and effectively and fight the flu. You want your yogurt to contain the active culture L. acidophilus, which is also helpful in fighting off yeast infections. The pectin and vitamin C in apples can help alleviate gout symptoms. The vitamin C helps to strengthen the immune system and the pectin helps the joints remain flexible. Onions protect the circulatory system and are a powerful antibiotic. They're good for urinary infections, and their diuretic activity helps with arthritis, rheumatism and gout. Beets are richer than spinach in iron and other minerals, and the greens are helpful in cases of gout due to the fact that the iron helps to oxygenate and purify the bloodstream. Cherries can help alleviate gout. Recent research, published in the journal Arthritis & Rheumatism, shows that eating cherries over two days reduced the risk of experiencing a gout attack by 35 percent, compared to not eating cherries. The key ingredient in cherries and cherry juice that helps gout is flavonoids. Flavonoids help to reduce the uric acid levels in the bloodstream. Flavonoids also help to prevent the inflammation that results from gout. There are a few possibilities for why these associations exist, researchers say. One is that vitamin C, which is found in cherries, can influence the amount of uric acid in a person's blood, according to Dr. Allan Gelber, who co-wrote an editorial accompanying the study. Make your morning meal oatmeal. It’s high in fiber, low in saturated fat and cholesterol and when combined with skim milk, gives you a calcium-charged boost to your day. By adding blueberries or raisins you’ll be adding some extra iron and potassium into the mix for a well-balanced meal. You can't beat turkey if you want a lean, nutrient-packed protein source that'll be easy on your stomach. Turkey is high in niacin, which helps lower cholesterol levels in the blood. Chicken without the skin is also a terrific low-fat source of protein. Both are easy to cook either indoors or out. Flavenoids are a chemical that scientists believe protect against heart disease. These chemicals are found in tomatoes, red wine, and dark chocolate. In a new study researchers found that organically grown tomatoes have a higher level of flavenoids that protect against cardiovascular disease. Published in The Journal of Agriculture and Food Chemistry the researchers said that the level of flavenoids in an organically grown tomato is almost twice as high as those conventionally grown. The lead author of the study was surprised by the increase in the amount of flavenoids found in the tomatoes over time. The levels continued to increase with each planting that used organic methods for pest control and fertilization. A chemical that has been found in foods that protect against heart disease is folic acid. In a recent study released in the British Medical Journal researchers found through evaluation of randomized and cohort studies that folic acid reduces the levels of hymocysteine concentrations in the blood. Homocysteine is responsible for an increased risk of cardiovascular disease resulting in both heart disease and stroke. The study showed that folic acid decreased the levels of homocysteine and thus reduced the risk of heart disease. Folate is found in green leafy vegetables, oranges, strawberries, avocados, peanuts, broccoli, asparagus, chick peas and lentils. Nuts and Seeds have also been shown to protect against heart disease. Several clinical studies have found that nuts have a beneficial effect on lipid levels in the blood. The study found that eating nuts daily decreased the total cholesterol and LDL cholesterol (the bad type of cholesterol) while raising the HDL or good cholesterol. Studies have also shown that the nuts will also increase the overall lifespan of those who consume them. In several large prospective studies (The Iowa Women Health Study, Nurses Health Study and The CARE Study) the researchers have found an inverse relationship between those who eat nuts and those who have a high risk of atherosclerotic heart disease. This means that those who eat a healthy diet of nuts have a decreased risk of the disease. Another known food that protects against heart disease are fish high in Omega 3 fatty acids. In a statement released in Circulation 2002 scientists revealed that omega 3 fatty acids appear to affect cardiac function, cardiac mechanics and arterial endothelial cardiac function. This means they protect the heart against arrhythmias and clogged arteries. Major food sources of linolenic acid and omega 3 fatty acids are flaxseed and fish. Farm raised catfish tend to have the least amount while salmon and trout appear to have the most omega 3 acids. Sardines are an awesome source of omega-3 fatty acids, along with calcium and niacin. You can prepare fresh ones on the grill, or canned sardines work great in salads or sandwiches. Mackerel is another excellent source of omega-3s, and is full of selenium, which is an antioxidant mineral which may help protect the body from heart disease and cancer. A great way to get omega-3s on the go is by grabbing a handful of walnuts for an afternoon snack. Add some to your green salad, or give chicken salad a nutrition boost by adding ground walnuts. Kidney beans are an affordable source of high fiber, are low fat, and have no cholesterol. Add them to salads and chili, as they truly are almost a perfect health food. Since canned varieties tend to be higher in sodium, try to use the dried varieties whenever possible. Whole-grain barley is rich in soluble fiber and insoluble fiber, which is good for combating constipation. It’s also a good protein source and has a good supply of iron and minerals. Choose whole-grain barley cereals, or substitute whole-grain barley for rice and pasta side dishes once a week. Oatmeal is a great way to boost your fiber content early in the morning, and it also has a low glycemic index, which helps to provide lasting energy stave off hunger. Choose rolled oats, and add some raisins, apples, and honey for flavor. Instant oatmeal isn’t a healthy option as it’s usually loaded with sugar. Including foods that protect against heart disease and stroke into your diet is a good start to protecting your heart and your future. This is an easy solution that requires little lifestyle changes and even less energy. The benefits to your long-term health and doctor bills will be amazing. Try it and see! Eating at least two cups of orange fruits/veggies like sweet potatoes, squash and carrots boosts intake of beta-carotene, which converts to vitamin A, essential for healthy skin and eyes, and which may also reduce the risk of some cancers, cardiovascular disease, and osteoporosis. Lutein and lycopene, also found in orange produce, also help reduce the risk of macular degeneration and may protect skin from sun damage and even reduce wrinkling as well. Mangos and cantaloupes are also beta-carotene endowed. Navy beans are loaded with fiber, which can help reduce your risk of color and other forms of cancer, as well as relieve the symptoms associated with diverticulosis. Women need 30 grams of fiber each day, so include them in your favorite chili recipe, or try them as a side dish alternative to pasta or rice. Packed with calcium, yogurt can help prevent osteoporosis. It has also been shown to boost immunity and help with weight management. Additionally, yogurt contains high amounts of good bacteria such as acidophilus, which helps to prevent yeast infections and urinary tract infections. It also contains protein, which may help your body battle the fatigue and weariness that follows a hot flash. As we age, we sometimes find ourselves forgetting things or feeling as if we’re in a fog. If you find this to be the case, grab for the blueberries the next time you’re shopping for groceries. Recent studies show they may actually help with short-term memory loss. They’re also loaded with antioxidants. Pair them with some low-fat plain yogurt for a top-notch way to protect both your brain and your bones. Avocado also contains antioxidants, such as vitamin E, which can help to protect your vision and skin, which can suffer as we age. The monounsaturated fat found in avocados has also been shown to improve the condition of hair and skin. They’re great on a turkey sandwich, or mash up a few ripe ones and whip up a quick side of guacamole to have with some low-fat baked tortilla chips. Research shows that certain nutrients and foods that have an abundance of certain substances have the potential to both help prevent and treat health issues that challenge the prostate, including prostatitis, benign prostatic hypertrophy, and prostate cancer. In other words, you have the ability to support and promote a healthy prostate every time you sit down to a meal. Tomatoes, watermelons, red grapefruit, papaya and red berries are all great sources of lycopene, a health-promoting plant pigment known for its cancer-battling ability. It also promotes a strong immune system and helps support prostate health in men. Though fresh are always an excellent option, the lycopene in cooked tomatoes is actually absorbed more readily by the body. It’s also your ally in the battle against heart disease. Quercetin, a flavonoid that forms the backbone of many other flavonoids, may have positive effects in combating or helping to prevent many different types of cancer, including prostate. It also acts as an antihistamine and has anti-inflammatory properties, which may be helpful in relieving the pain of an inflamed prostate. Foods rich in quercetin include apples, black & green tea, onions, raspberries, red wine, red grapes, citrus fruits, broccoli & other leafy green vegetables, and cherries. Quercetin can also be found in honey and sap, including the type from eucalyptus and tea tree flowers. Several studies have demonstrated a lower chance of developing prostate cancer among men who eat large amounts of broccoli or other cruciferous vegetables. Although the reasons as to why broccoli is so beneficial for staving off cancer are still unclear, some researchers propose that one of the phytochemicals found in these vegetables, called sulforaphane, selectively targets and kills cancer cells while leaving normal prostate cells healthy and unaffected. Legumes such as beans, peanuts and lentils all contain biologically active plant compounds known as phytoestrogens. Isoflavones, a phytoestrogen, may contain cancer-fighting properties, which suppress tumor growth in prostate cancer cells. Of all the different types of nuts, these natives of South America are an especially rich source of the mineral selenium, which is important for prostate health. In fact, just one ounce of Brazil nuts can contain as much as ten times the RDA for selenium. Research has shown that selenium intake is associated with a reduced risk of prostate cancer. Much like red wine or green tea, pomegranate is a rich source of antioxidants and has been touted as a miracle fruit in preventing chronic diseases related to oxidative stress. In particular, pomegranates are rich in a phytonutrient called ellagitannin that is especially helpful in promoting prostate health. Although pomegranate itself can be a challenge to eat, pomegranate juice is readily available as a popular choice. Polyunsaturated fats, like omega-3s and omega-6s, are essential fatty acids found exclusively in the diet and not synthesized by the body. The traditional Western diet has lot of omega-6 fatty acids, but minimal omega-3s. Having a balance of omega-3 and omega-6 fatty acids may help prevent the development and progression of prostate cancer. Study results reported that eating salmon at least once per week might reduce a risk of developing advanced prostate cancer even if it is genetically predisposed. Pumpkin seeds offer some unique health benefits for the prostate, especially for men who have benign prostatic hypertrophy (BPH). This condition, which involves enlargement of the prostate gland, commonly affects men 50 years and older. The pumpkin seeds’ oil help prevent the hormones from triggering multiplication of prostate cells. This oil also contains carotenoids and omega fatty acids. Another nutrient found in pumpkin seeds is zinc, which is also associated with prostate health. A recent study suggests that zinc protects against the development of prostate cancer. Cayenne peppers get their heat from a high concentration of a substance called capsaicin. Along with its anticancer abilities, capsaicin also offers cardiovascular benefits because it is a potent antioxidant that fights free radicals that can lead to atherosclerosis. It’s important to remember to get a healthy balance of foods to keep your prostate healthy, including antioxidants, vitamin E from nuts and seeds, and drink plenty of clear fluids to help flush the bladder. Try to avoid caffeine and alcohol. Keeping your weight in check will also help maintain a healthy prostate. Citrus fruits, red berries, tomatoes, potatoes, broccoli, cauliflower, Brussels sprouts, red and green bell peppers, cabbage, and spinach are all excellent dietary sources of vitamin C, which helps promote a healthy immune system. The B-complex vitamins are actually a group of eight vitamins, which include thiamine (B1), riboflavin (B2), niacin (B3) and folic acid (B9), and are essential for a healthy nervous system, processing carbohydrates for energy, and the creation of red blood cells. Organ meats, beans, whole grain cereals, oatmeal, potatoes, salmon, bananas, and spinach are only a few of the many food members of the vitamin B group with high levels of this group of nutrients. Vegetable oils, nuts, green leafy vegetables, and fortified cereals are common food sources of vitamin E, an antioxidant that acts to protect your cells against the effects of free radicals, which are potentially damaging by-products of energy metabolism. Free radicals can damage cells and may contribute to the development of cardiovascular disease and cancer. Vitamin E has also been shown to play a positive role in immune function. Green Leafy Vegetables. Leafy greens contain a lot of magnesium. Magnesium is an important mineral that has the power to relax muscles. Fish Oil. Fish oil contains essential fatty acids that help with serotonin uptake in the brain. Serotonin makes you feel good mentally and enables your brain to better cope with stress. You can get your fish oil from certain kinds of fish, such as salmon, or from supplements. Chocolate. A small piece of dark chocolate each day can actually provide you with many health benefits. Chocolate has a stimulating effect. The caffeine also helps to increase serotonin. It's okay to indulge in chocolate in small amounts! Red Wine. Many experts believe that a glass of red wine each day provides health benefits. The only drawback is that it's easy to overdo it when drinking alcoholic beverages. Wine is packed with beneficial antioxidants and can temporarily lower blood pressure and help you relax. Oatmeal. Oatmeal and other carbohydrates also help increase serotonin levels in the brain. In fact, your brain needs carbohydrates in order to function normally. This is why it's essential to include good carbohydrates like oatmeal in your regular diet. Lean Meats. Lean meats can help you combat stress by providing a good source of protein. Turkey, eggs, chicken and fish are all good choices because they contain necessary amino acids for healthy brain function. Remember not to eat fatty meats because the fat can interfere with proper digestion of the amino acids. Coffee. Yes, caffeine is a stimulant and there is also a risk of developing an unhealthy habit. However, moderation is the key. Coffee can help stimulate the brain into working with more energy and efficiency, helping you feel more motivated and less stressed. Nuts. Nuts help you maintain your proper blood sugar. They also contain plenty of the vitamin B complex, which combats fatigue. Spinach. Spinach is one of the world's super foods. It contains many vitamins, antioxidants and omega 3's. This means it would be hard to eat spinach and not feel good! Coconut and coconut butter, or more commonly known as coconut oil, has been used as a food and medicine since the dawn of history. Unlike saturated animal fats found in meats and dairy products, coconut butter is a raw saturated fat containing fatty acids which the body can metabolize efficiently and convert to energy quickly. Research also shows it helps to regulate thyroid function. Kelp is a stellar, nutrient-dense sea vegetable. It is also known as Laminaria and contains a natural substance that enhances flavor and tenderizes. Kelp works as a blood purifier, and promotes adrenal, pituitary and thyroid health. Its natural iodine may help normalize thyroid-related disorders, like overweight, and lymph system congestion. Turkey is one of the leanest protein foods and is low in calories, making it an excellent healthy food choice. Turkey also contains selenium which has been shown to inhibit cancer development, improve the immune system, and aid in the metabolism of our thyroid hormone. Thyroid patients should avoid the consumption of goitrogens, substances that suppress the function of the thyroid gland, and which can also cause an enlargement of the thyroid. Goitrogens are in foods such as broccoli, cauliflower, Brussels sprouts, cabbage, mustard, kale, turnips, and canola oil. Soy and peanuts also include goitrogens and should be avoided. Both copper and iron are so important for thyroid function, so thyroid patients should take time to make sure they’re getting enough in their diets. Foods such as organ meats, oysters, clams, crabs, cashews, sunflower seeds, wheat bran cereals, whole-grain products, and cocoa products are all rich in copper. Foods like leafy green vegetables, beans, shellfish, red meat, and poultry are high in iron. Complement your iron intake with adequate amounts of vitamin C from foods such as citrus fruits, red berries, tomatoes, potatoes, and bell peppers to help maximize your body’s iron absorption efficiency. 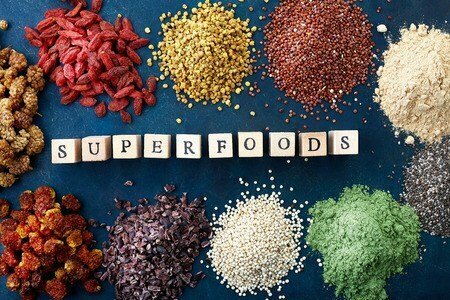 When you hear about superfoods, it can sound somewhat intimidating. It may sound like you have to spend a great deal of money and completely change your diet, or force yourself to eat meals that taste unpleasant. In reality, though, superfoods are just regular foods – some are unusual, but they are generally just really healthy foods you can include in your regular diet. Berries like strawberries, raspberries, blueberries, and cherries are superfoods which contain important vitamins and minerals, and are rich in antioxidants. * Blueberries, sliced strawberries, and raspberries are good on hot or cold cereal. * Freeze any berries and use them in smoothies. * Puree berries and freeze into popsicles. * Frozen berries are tasty eaten out of hand. * Serve a mixed fruit salad that includes berries. * Top shortcake with whipped cream and berries. Green tea is not only considered one of the superfoods which is full of antioxidants; it's also purported to help boost weight loss. Many stores offer flavors of green tea to make it even more enticing and fun to include in your diet. Green tea can be consumed in various ways. * Brew green tea and drink hot for your morning cup. * Mix green tea with your regular black tea, hot or iced. * Coffee can also be mixed with green tea. * Flavor green tea with fruit juice and drink it iced. Health professionals point out that flax seeds (one of the healthiest superfoods) should be ground up into a flour or meal for you to get the full nutritional benefits. Whole flax seeds pass through the digestive tract intact, meaning you don't get any of the healthful benefits. Try including flax meal into your everyday diet with some of these ideas. * Replace part of the flour in your favorite baked goods recipe with flax meal (breads, cookies, muffins, and so forth). * Sprinkle flax meal on hot or cold cereal. * Add flax meal to smoothies. * Sprinkle it on yogurt. Look for raw nuts in your local grocery or health food store. Raw nuts are probably healthier, as they do not contain any added fat or salt, and heat has not destroyed the healthy fatty acids in these little superfoods. * Sprinkle chopped nuts on oatmeal, cold cereal, or salads. * Roll peeled bananas in chopped, raw peanuts. * Dip apple slices in melted dark chocolate and roll in chopped nuts. Apples and dark chocolate are considered superfoods, too! Due to high Omega-3 Fatty Acid content, fish is one of the best superfoods to protect your heart and cardiovascular system. If you're not used to fish, it can seem intimidating. But it's really an easy food to prepare. Here are some ideas. * Have a “fish night” at least once a week. * Mild white fish can be cut into strips and used to make healthy homemade fish sticks. * Broil salmon and baste with lemon juice and olive oil. When looking for a quick nutritious dish, many of us turn to the old reliable bowl of salad. It's quick and easy, especially if you use all the handy bags of salad makings. But a bag of lettuce doesn't exactly win prizes when it comes to nutrition. Nor does it fill you up and keep you satisfied for long. So how do you turn a quick salad into a nutritious salad? Let's take a look at a few ways to take that simple salad up a notch or two. We might as well start at the beginning. The most basic salad can be better when you choose healthier greens. Just like any vegetable, the darker the greens, the more nutrients they offer. Don't limit your greens, whether lettuce or others, to one color or variety. You can find packages of mixed greens that offer choices, or you can create your own healthier blend of greens. If you have some standard iceberg lettuce, go ahead and use it for the splendid crunch, but mix in some other greens like escarole, frisee, or even baby spinach. Don't forget to try some mustard greens for a spicy kick. And, all these greens offer lots of nutrients that our favorite iceberg lettuce does not. Look at your refrigerator and pantry. Are there vegetables lurking there? Perhaps there are veggies that you might not have even considered for a salad. Maybe you don't have a fresh tomato or cucumber. What would a salad be without these two veggies? Wait and see! Grab a carrot and peel pretty shavings into the salad bowl. Chop up those celery tops you've been saving for soup. Do you have frozen okra, corn, green beans, or sweet peas? Toss them in. If you need to have a bit of tomato but don't have a fresh one, don't despair. Open a can of diced tomatoes and spoon out a few. The flavor will surprise and delight. Don't let the idea of a ‘side salad' keep you from adding any vegetable you want to your new and improved salad. Here's where the nutrition takes another leap. If we're talking about taking nutrition up another notch, we have to mention protein. No meal is complete without a good amount of protein. But, in a salad, you need to be creative. Chop up cooked chicken, fish, or meat and throw it in. But, don't stop there. Remember to hard-boil some eggs, mash them up, and sprinkle on top. A can of white Albacore tuna, flaked slightly, makes a delicious and nutritious addition. Skip the croutons and add nuts for protein and crunch. Rinsed canned beans or oven baked crispy garbanzo beans are another protein rich source. Cheese is another good source of nutrition. Use shredded hard cheese like Parmesan or crumbled soft cheese like Bleu cheese for interesting flavor, texture, and nutrition. When you're looking for super salads, look no further than fruits and berries. Choose first for color and then for taste. You really can't lose when you add any sweet fruits and berries to a cold, crispy bowl of greens. Strawberries, orange segments, and tart apples are just the beginning. Include some fresh pineapple, mango, or pomegranate to the list and your salad will be full of color and nutrition. Blueberries, blackberries, and raspberries add lots of antioxidants and make any salad stand out. With any nutritious dish, salads are best when you combine flavors, textures, and colors all together in one arrangement. Consider combining all these elements when you choose your ingredients and you will be guaranteed a successful super salad! Despite knowing the great health benefits of green vegetables, getting children (and sometimes even adults!) to eat greens can be frustrating. Set an example – If your little ones do not see you eating green vegetables, there is no way you will be able to convince them. Make it fun – Make stories for lunch time or dinner time where greens can be used as props. Broccoli can become miniature tress and spinach can be the undergrowth in a forest. Start with little portions – If your children are reluctant to try the greens, make them eat one bite for one meal. You may want to make this a rule or set a competition between two siblings. Over a week, you can increase the helping. Rewards work well – When greens are finished on the plate, reward this with something you know is important for your child. Create a sticker board and give a reward once they reach a certain number of pre-decided helpings of greens. Make pictures – Making pictures and patterns out of greens is easy. This helps it make a little interesting and may attract the younger child. The older ones may need more persuasion. Make it tasty – There is nothing better you can do than to make the greens tasty. Try different recipes and check how to can make greens tasty without losing the nutrient element. Offer greens when hungry – Giving greens as the only option when they are hungry might work for some kids too. Disguise them – Hiding green sin different kinds of dishes is another option that you have. Check out some ways in which you can get these greens to enter your child’s nutrition below. Smoothie – Add a few leaves of kale or spinach in a smoothie and your child will never know. Some milk, a medley of fruits and honey along with the greens should do it. Pasta – Make pasta sauce from scratch and add in greens to your tomato based sauce. The white sauce can also be embellished with cut and steamed greens. Soup – Soup is another way in which greens can be hidden and served up. Mash up the steamed greens along with the other vegetables and meat and it will be gobbled up before you know it. Leafy crisps – While this option does remove a significant amount of nutrition, it is better than not having them at all. Kale or spinach crisps are easy to make and easy to eat as well. Breads – If you are a baker, you can bake some breads that incorporates greens too. Stuffing – Stuffed chicken with green vegetable stuffing can be delicious. Choose to offset some of the flavor with garlic and butter. Select a day in the week to cleanse your liver. Eat a breakfast without any fats, and with lots of fruits. You can undergo liver cleansing twice in a year. Spring is the best season to cleanse the liver. Avoid doing this in the winter season. The liver is a vital body organ that produces cholesterol, metabolizing nutrients, and breaks down toxins. The intake of a wide variety of fruits ensures that you are following a healthy and natural process to cleanse your liver. An occasional fruit diet would also help you in reducing weight because these are low in calories. Apple, banana, blackberry, raspberry, pumpkin, and all other fiber-rich fruits work excellently as cleansers. These high fiber fruits are great for your liver since they lower the cholesterol too. Fruits like orange, grapefruit, or lime help reduce your sodium intake. You can also use such fruits to flavor your salads instead of adding salt to them, which would lead to high sodium intake. This intake can deplete your body of water, and even cause obesity. Fruits are very high in liquid content. They are rich in antioxidants, nutrients, vitamins, and fiber. You can even consume fruit juices to cleanse your liver. In fact, through a fruit juice cleanser you will feel lighter, healthier, and much more energetic. The nutrients in fruit juices boost your immune system and get rid of harmful, liver-damaging substances. Apples are superb for the liver since they are water based fruits. They aid in controlling digestion and cholesterol production. Apple contains natural sugar and vitamin c which cleanse your liver and make you feel energetic. It is rightly said that “An apple a day keeps the doctor away”. Pears contain a mild laxative effect, which is great for aiding excretion. Watermelons are rich in water. They help flush your liver and cleanse it rapidly. This plays a major role in filtering out body toxins, which is highly beneficial. Grapefruits quickly purify your liver effectively and refresh your system. Cherry helps in reducing toxic stress. It is high in antioxidants which cleanse the liver and prevent it from getting harmful infections. Such a great post! I am blown. It is actually going to be an answered prayer to many.